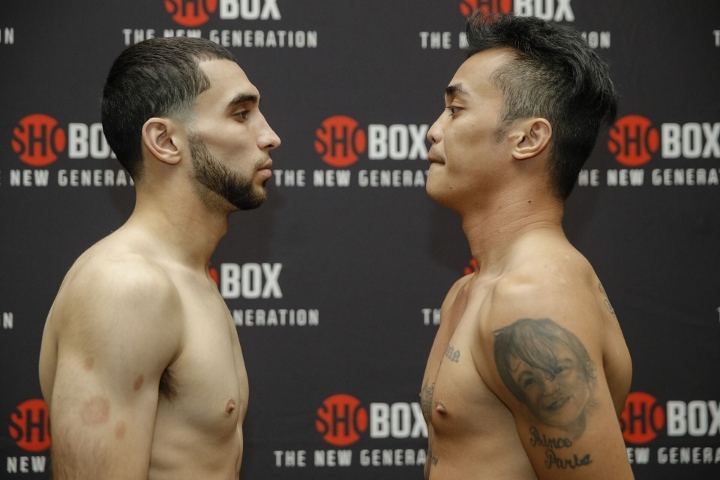 Three undefeated prospects making their ShoBox: The New Generation debut all made weight, as did their opponents, at the official weigh-in for Friday night’s Mayweather Promotions’ Sin City Showdown live on SHOWTIME (10 p.m. ET/PT) from Sam’s Town Live in Las Vegas. 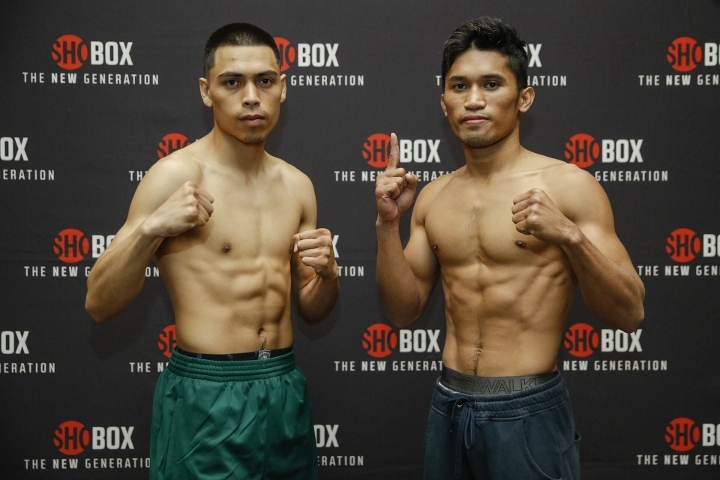 Top 122-pound prospect Angelo Leo (16-0, 8 KOs) will square off against Filipino Neil John Tabanao (17-4, 11 KOs) in a 10-round super bantamweight bout in the ShoBox main event, while super featherweight Xavier Martinez (13-0, 9 KOs) will take on John Moralde (21-2, 11 KOs) in a 10-round co-featured attraction. 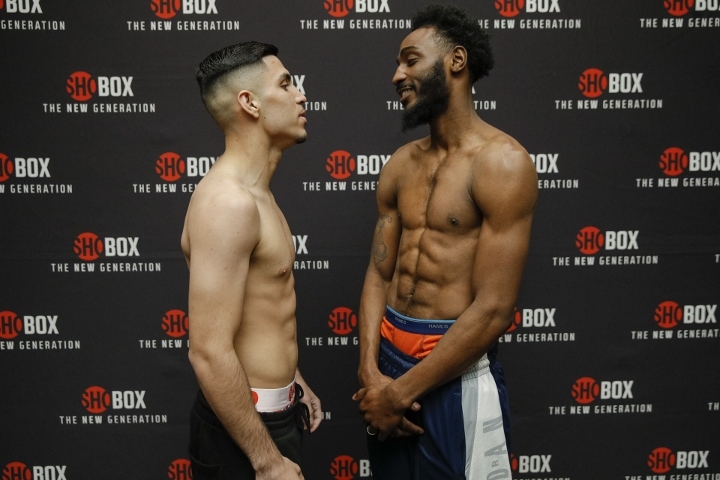 In the telecast opener, Las Vegas prospect Andres Cortes (10-0, 6 KOs) will face Baltimore’s Jahmal Dyer (9-1, 5 KOs) in an eight-round super featherweight bout. Here is what the fighters had to say on Thursday from Sam’s Town in Las Vegas. 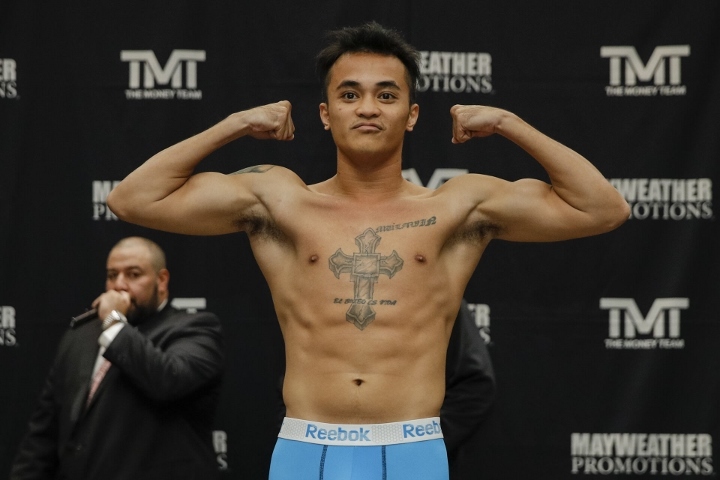 Angelo Leo – 123 lbs. 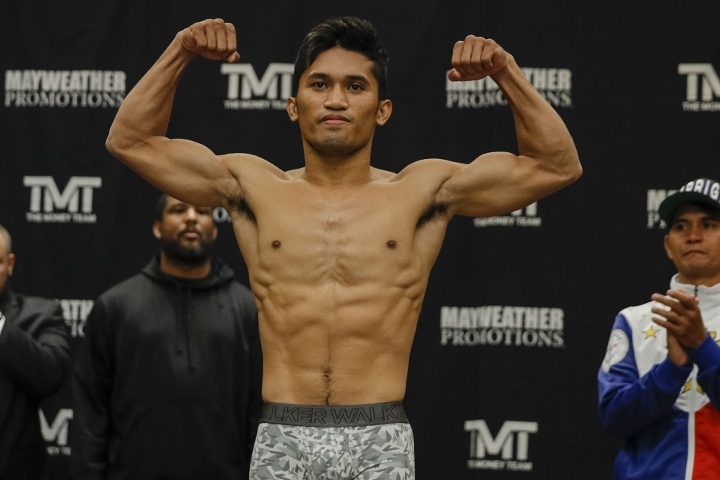 Neil John Tabanao – 122 ¼ lbs. 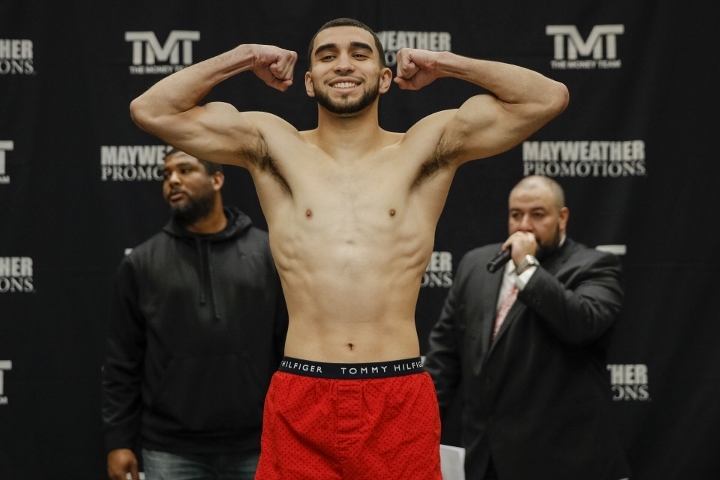 Xavier Martinez – 131 ¾ * lbs. 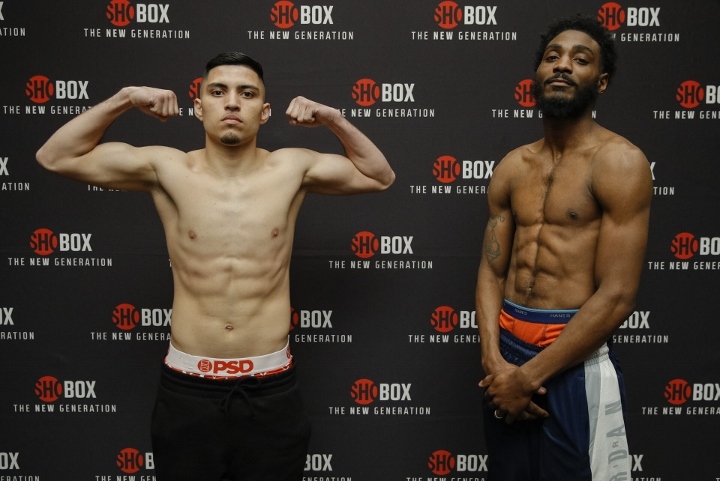 John Moralde – 131 ½ * lbs. Contracted weight is 131 pounds. 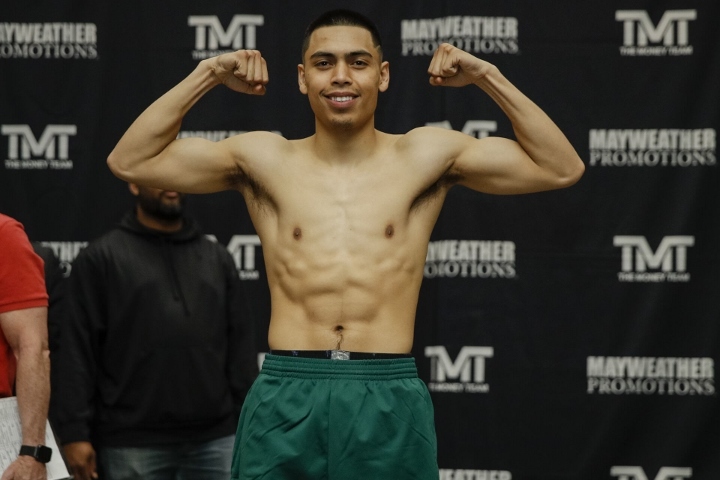 Andre Cortes – 132 ¼ * lbs. 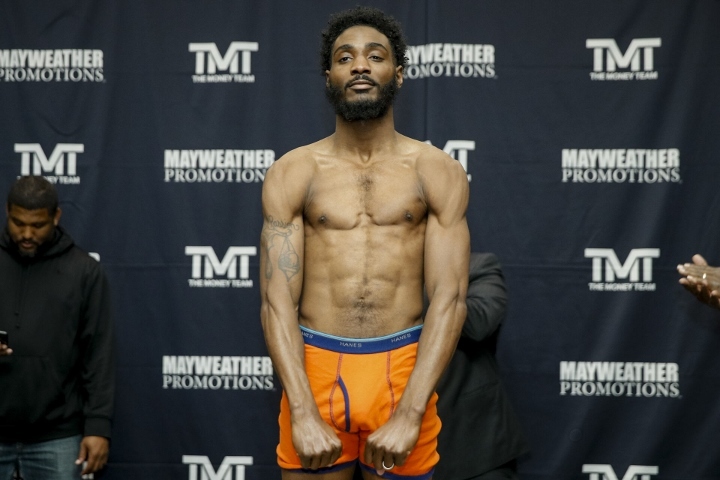 Jahmal Dyer – 130 ½ * lbs. Contracted weight is 132 pounds. “I’ve been in Vegas for about two years and training at Mayweather’s gym. I’m from Albuquerque and it’s a good fight town. We have some champions there, including Austin Trout and others. “My style is a unique style – it’s a boxer-puncher style. I would say my style is really versatile. I can also punch if I need to – it depends on how my opponent fights. “In my 122-pound division I have a good height advantage and I’m one of the taller guys. I’m best at 122. It’s tough to make weight, but this is the best weight for me. “This is my national TV debut but there’s no pressure. I’ve been visualizing this moment since I was a kid. “My style is come-forward and aggressive. My style always depends on my opponent and what he shows me. 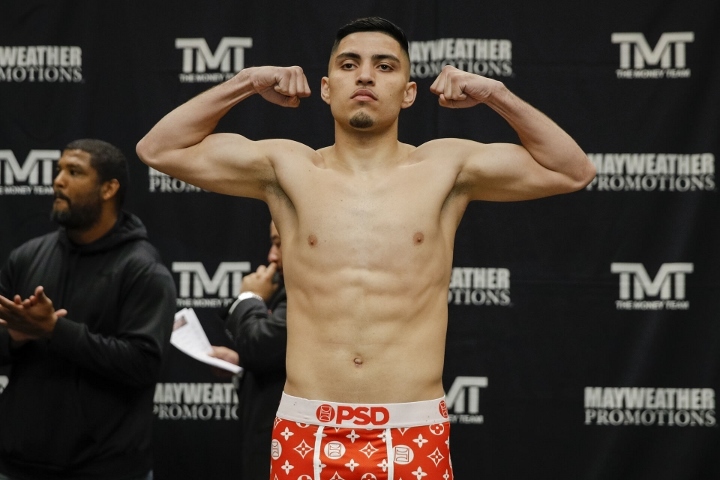 “I’m excited to be in America to continue my career but this is a Mayweather Promotions fight and a lot of people will be watching. So overall it’s great for my career. “I know [Leo] is good because he knocked out my teammate, Glenn Porras. “My mother passed away in December at age 48 from stage 5 kidney disease. I am dedicating this fight to her. “I’m an action-packed fighter. I’m a very slick, skilled boxer and improving with each step. It’s a great fight for me and I can’t wait to get in there. “It’s more than a fight, you have to sell yourself out there. I’m from a good fight town in Sacramento, but I knew I would have to move to Vegas to step up against the best. “I’ve watched a lot of Floyd and Diego Corrales. I was born in 1997 so I was 3 or 4 years old when I started watching those guys. “With this game, it’s patience. And one thing I’ve learned from Floyd is to be patient. He says get it done the right way, and don’t rush. Because that’s when you mess it up. “I’m an exciting fighter and I like to throw and mix it up in there. “I want to make this a statement fight. If I don’t get him out early, because he’s tough, then I’m going to beat him down. “I’m a southpaw with a lot of experience and had more than 300 amateur fights with 270 wins. “It’s a great step-up fight for me. I respect my opponent and know he’s going to bring it. “Boxing has always been a big part of my family’s life and I’ve been boxing since I was six years old. Four of my siblings are boxers and one is a professional. “The guys who I have sparred with are bigger than me so I’m fully prepared to go in there and take care of business. “I’m mean and I’m aggressive. I’m an animal. I’m here to mess things up and destroy people. “I’ve taken care of myself through this training camp and I’m motivated to continue climbing and making a name for myself. “I’m a quiet guy outside the ring. I’m smart and intelligent outside the ring, but also inside the ring. Growing up all we knew was how to bang. But I’ve matured a lot. “I’ve sparred some tough guys, including Gervonta Davis. That’s when Floyd [Mayweather] saw me and wanted to sign me so we did it. “I’m an aggressive counter-puncher and I can take a shot. I’ve been especially working on my defense. My brother Luis is in my corner and he was a decorated amateur and won the Gold and Silver Gloves. Now he’s focused on helping me. He never turned pro, but I’ve seen the things he’s done and learned from them. “I think people will remember me after I knock this guy out in my backyard. It’s gonna be something you don’t want to miss! “He’s just another guy I’m stepping into the ring with. He’s nothing special. “I’m a boxer with a strong right; look it up and you’ll see the video. “I took some time off of my full-time job to get ready for this.